Saturday April 2nd 2:30pm – 4:00pm Gallery Kayafas presents Mags Harries artist talk “Nothing Is What It Appears To Be” on her show “Precautionary Tales”. 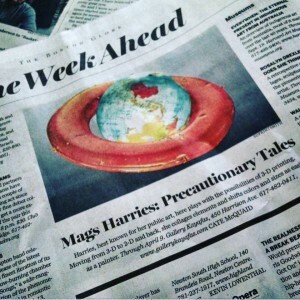 Mags Harries show “Precautionary Tales” was highlighted in the Globe’s Week Ahead by Cate McQuaid. “Precautionary Tales” is at Gallery Kayafas in Boston though April 9th, 2016. Tuesday – Saturday 11- 5:30pm.